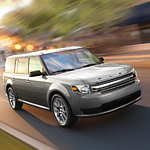 The Essential Ford Flex Technological Features | Karl Flammer Ford Inc. The Ford Flex comes complete with active park assist technology. This feature makes parallel parking an easy task. The Ford Flex also has intelligent all-wheel drive. Thanks to this system, a driver has better control of the road, no matter the prevailing weather conditions. If you would like more information about the Ford Flex technological features, the sales team at Karl Flammer Ford Inc. has all relevant materials for your use. Indeed, you can access information about all of the Ford Flex features. The dealership is located conveniently in Tarpon Springs.